This highly liberating assistive wireless device facilitates face-to-face communication between deaf/hard-of-hearing and hearing people! The UbiDuo communication device is a state of the art face-to-face communicative assistive technology device with a sleek package that includes a colour touch screen and patented hinge system. 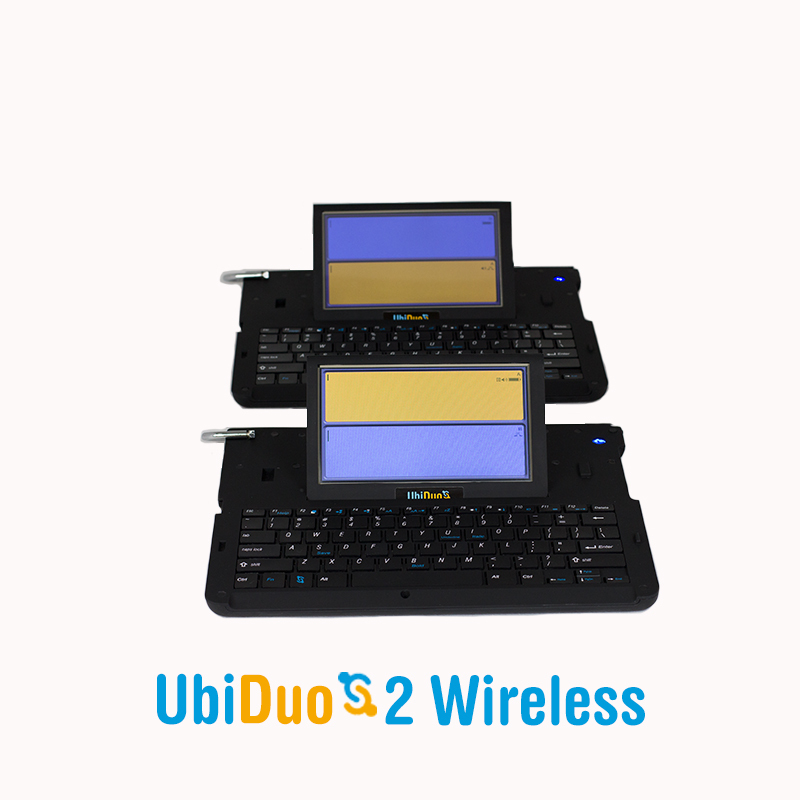 The UbiDuo 2 is the world’s foremost independent communication solution for people who are deaf or hard of hearing. The unique patented hinge technology holds the two halves securely in place for easy transportation, and its 8-hour battery life ensures you won’t be left stranded in the middle of those important conversations. Use UbiDuo assistive technology whenever you need a solution to facilitate face-to-face communication between deaf/hard-of-hearing and hearing people. This revolutionary device will help to eliminate bluffing, frustration and Communiphobia, as well as promote communication equality. Use it to empower people to share their thoughts and emotions seamlessly in real time just as in a normal conversation. The Standard Wireless model of the UbiDuo connects each half with a built-in proprietary networking protocol that has a range of up to 300 feet. If you are deaf, hard of hearing, or have communication difficulties and are interested in obtaining your very own UbiDuo 2 communication device, please contact us. You may also be able to get the UbiDuo 2 through NDIS. I could feel my communication potentials opening up. I felt ready to communicate with the world with UbiDuo. Now I can be able to talk to anyone. We are able to talk about our ideas and our deep thoughts and do this in a rather quick way compared to our old way of using a pen and a pencil. We use the UbiDuo most of the time instead of interpretation services because of the fact that we are in a rural community and it takes us anywhere from 30 minutes to 2 hours or longer to get an interpreter to do our interpreting for our hearing impaired or deaf patients. We could communicate so freely in depth in shorter time. No limitations! My biggest impact in using UbiDuo 2 is having open channels of communication that I never thought I will have. It is a growth of new relationships for years to come. Life after this is amazing. It is so free and independent. I can schedule an appointment and go anywhere with this!